I always love Frank Bruni. This Sunday’s column is about how to decide if you’re a college senior which college will end up being best for you. First, I think he’s asking a lot of seniors. I had no idea which college “felt” right to me. Some felt more right than others, I suppose. But mostly I ended up choosing on the basis of which school gave me the best financial aid package. Luckily, Wesleyan was a great choice. But I think my experience is more typical than the scenario that Bruni describes. Second, the research shows that it does matter where you go to college. Especially for low-income students. Certain colleges open up more doors than others. In this time of economic uncertainty, I don’t think we can ignore that. However, he is right that you may end up feeling happier — however you want to judge this — at a school where you feel comfortable. Sociologist Patricia McDonough has done some thorough work on this. 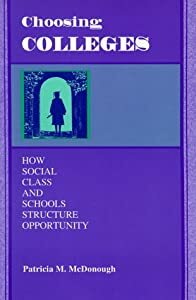 Although a bit dated now, her book (cleverly called Choosing Colleges: How Social Class and Schools Structure Opportunity) describes the complex factors — particularly related to social class and the effects of guidance departments in many types of schools — that affect the decision to attend college and which school is chosen. How did you “choose” if you went to college? How did you choose where you went? Did you choose a school where there were mostly people like you, (i.e. from the same social class or same background)? Do you think your life would have been affected if you chose someplace different? Really very useful information. Choosing the right college to go to after high school is really an important decision to make. There are so many essential things to consider when choosing a college.